Rare opportunity to find a true blue water vessel that has spent its life being pampered in the freshwater of Minnesota. Short boating seasons and indoor winter storage combined with proper and constant upkeep makes this boat show impeccably. Recent upgrades including, KVH sat TV, newer cockpit carpet, newer bridge enclosure. Low hours on Cummins QSC diesel engines, these are the fully electronic, common rail fuel delivery, no smoke on start up and very smooth and economical with only 505 original hours. Bow thruster, autopilot, C-120 plotter and radar display.These boats provide a massive amount of living space. 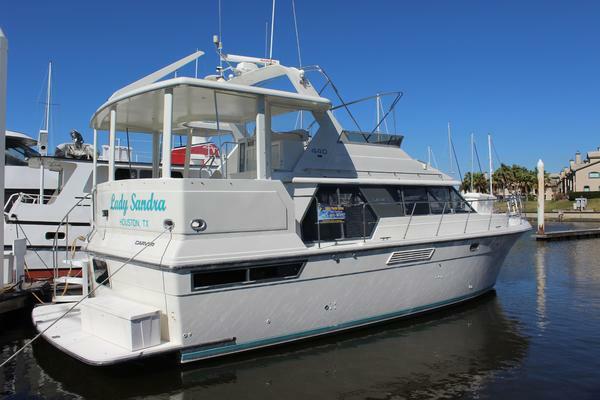 Full beam master, huge salon, full-size galley, two head with two stateroom layout. Exterior space is also unrivaled with a spacious aft deck and large and comfortable enclosed bridge. Interior woodwork is impeccable, finished floors throughout with carpet laid over the top, the bottom is solid fiberglass. Hardtop mounted davit for dinghy placement on hardtop or on the swim platform. These boats are extremely user-friendly with good schematics and all hoses, valves and fuel lines are marked from the factory. Anyone looking to do the loop, head south at some point or in the market for a beautifully maintained and loved freshwater motoryacht "Lorien" is a must see.Original owners bought this boat new on West Coast of Florida and very shortly thereafter (matter of months) ran her to their home marina at Lake City, Minnesota where she is currently berthed. The remainder of this seasons slip fee is included in this sale.Offers are welcomed on this beautiful vessel. United Yacht Sales New Jersey would love to guide you through a personal showing of this 50' Jefferson 50 Rivanna Se 2006. This yacht for sale is located in Lake City, Minnesota and priced at $369,000. For a showing please contact us by filling out the form on this page and we will get back to you shortly! 3 Sharp Aquos HDMI LCD TVs: 26", 20" and 15"
Bridge:You will see in the pictures that the visibility from the bridge is excellent. Molded fiberglass helm with a single captains chair surrounded by benches with upholstered cushions and storage underneath. Carpeted floor (removable). Seating for 10 would be no problem. Elevated seating area on location where you would goto aft hardtop. Hardtop has radar arch with closed array radar, KVH dome, antennas, steaming and anchor light mast. Hardtop also has "Nautical Structure" davit and location for dinghy storage.New white canvas bimini top with zip open enclosure windows (all very nicely done - top notch). Aft Deck (Sundeck):The aft deck area is one of the most desirable features of this vessel. Much time is spent relaxing, entertaining or hanging out while underway. Shaded area with hardtop enclosure makes for a weather proof area that is still open air. No cumbersome enclosure pieces to wrestle with and constantly try to maintain. Wet bar and fridge are located in molded fiberglass area to the forward and starboard of salon door. This wet bar is extra sharp as when it is closed up it fully flows into the feel of the area with it's finished fiberglass surfaces. Very sharp and functional use of an area. There are hard framed doors on both port and starboard that lead to the deck walkways. Just forward of these doors is opening railings that are boarding gates to both port or starboard access points for tide ride style or any other boarding ladders as wells as access to fixed docks. Salon door is center of aft deck with stairs to bridge and hard framed bridge door to port of salon door. Overhead speakers and lighting round this out. Spiral stairs lead down to swim platform for easy access to floating dock. Storage, wash down, transom shower and cable master 50 amp are on the swim platform to port.Engine Room and Mechanical:Engine room is a thing of beauty. Every through hull, switch, handle, etc... is factory labeled. It is very easy to "read" the flow of all systems on this vessel with the many labels. It really makes for ease of ownership and a solid sense of knowledge for any level of boater. In addition to the well laid out and labeled mechanical system this engine room shows as that of a babied and freshwater machine. There is zero signs of any corrosion, rust or any other negative attribute to even the most highly maintained sea water boat. Sight levels on fuel tanks and analog engine gauges make for sure knowledge. Extremely clean and well laid out engine room here! Five bilge pumps with redundant high water alarms. Cummins mains - Common rail, electronically controlled QSC series. These are no smoke, very smooth and fully electronic engines. Top notch. 70 additional horse than their mechanical 480C counter parts. Stainless Plow Anchor, 45 lb. This boat has a solid fiberglass bottom and is fully built to US specifications.